Home » Posts Tagged "electronics"
The inspiration for this project came from @nivnov pointing me to http://wallbox.weebly.com/. 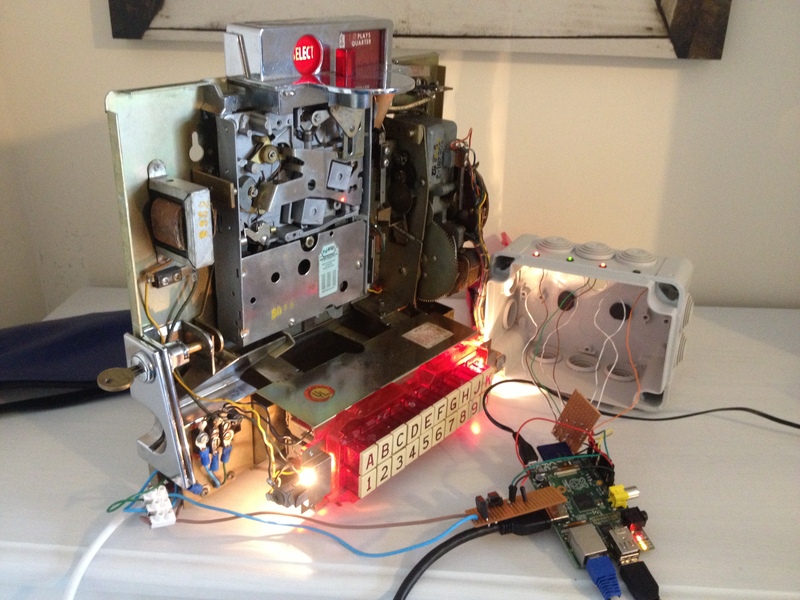 I had somewhat of a different take on the circuitry and software than it’s author, Steve Devlin. The pulse train of my Wallbox was also different. This is all explained below. A wallbox is a device dating from circa 1950s USA. 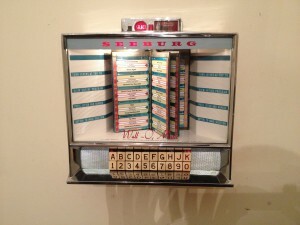 It was placed on tables in diners to increase revenue from Jukeboxes. It contains no music, nor does it have a speaker. 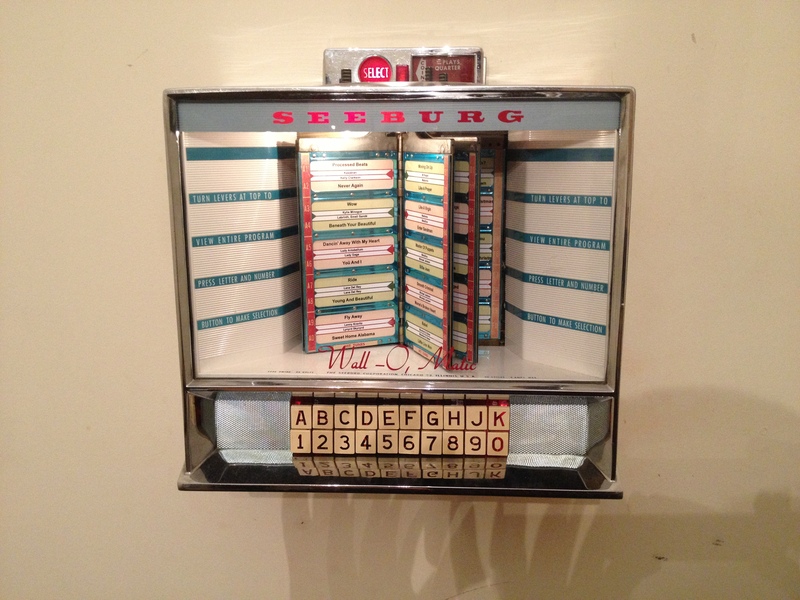 It could be considered a remote control for the diner’s main Jukebox. 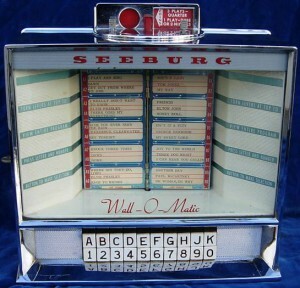 I opted for a Seeburg Wall-O-Matic 100 Type 3W100. Wallboxes will be heavily mechanical with very basic circuitry. They will function such that a key combination will be output as a train of electrical pulses caused by an arm rotating over a set of electrical contacts. 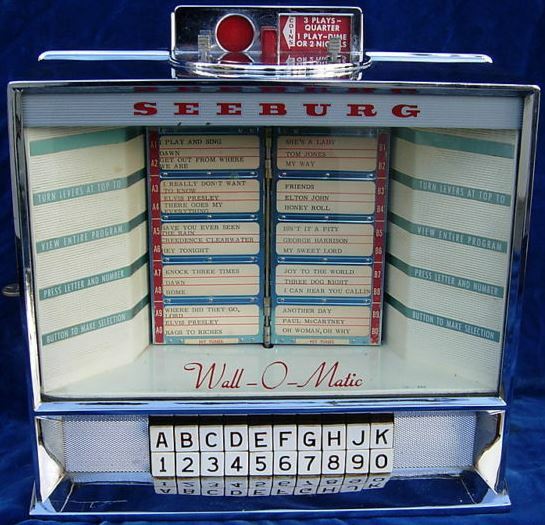 The wallbox would have, traditionally, been powered from the jukebox. To use it standalone for this project, an AC-AC transformer was required. My Wallbox required 25VAC at a maximum of 3 amps. I used a Torodial transformer, mounted with its mounting washers, in a die-cast aluminium box. It kicks out a lot of heat so the box acts as a decent enough heatsink. The wall boxes are traditionally unearthed. This seemed like a bad idea so I attached an earth to it via one of the unit’s screws. For the uninitiated, an Opto-isolator is an LED and a light activated transistor bundled into a single chip – it’s like a relay. In my case a DIP. I used a Vishay 4N25 but anything similar to that would be fine. The left of the circuit connects to the Wallbox’s 25vAC and Signal terminals; the right connects to the RasPi. I also hooked up 4 LEDs to the Pi to provide some kind of debug output in the event of software errors. As I eluded to above, the key combination is electrically pulsed by a rotating arm. Steve had the good fortune of having an oscilloscope to hand; I sadly didn’t. Rather, I started on the code that would decode the pulses and, initially, used it as a timer. It was clear, after filtering jitter, that the pulse train had a clear time gap in it. In Steve’s case, this gap represented a break between the letters and numbers. In my case, it represented the 20s in a base 20 numbering system. The pulse train is sequential to represent A1 through to K0. If X represents the number of pulses before the gap and Y represents the number of pulses after the gap, X increments from 1 to 20 whilst Y stays at 1. Y then increments and X resets back to 1. The cycle repeats through to X=20, Y=4 for K0. Handling kernel level interrupts came with some problems of its own. Most notably, having to think sort-of-thread-safe when writing the code. The interrupt can… well… interrupt code processing at any time. If this is part way through a calculation, things get funky. This code is what I came up with. The Sonos “API” is a UPNP bastardization and is, frankly, horrible. PHP being my strongest language, I thought this the best way to tackle it (hence the C code’s interface with an external programme). I forked a pretty crappy Sonos class on GitHub and set about fixing/improving it. I’ve added multicast Sonos device detection and, most importantly for my requirements, Spotify support. The resulting code is on my GitHub account. Also here’s my usage of the class. I then used some more throw-away code to populate these with the track info. That throw-away code is here. Again, don’t judge! I may have stumbled across a loophole in the Staples pricing system as they printed these on cards and individually cut them all out for not a lot of money. I mounted it on the wall and put the pi, circuitry, transformer, etc. on the other side of the wall to keep things clean. Picture below. Presumably everyone knows what the Raspberry Pi is, by now, so I’ll not start there. 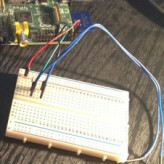 You may or may not know that the RasPi has General Purpose Input/Output (GPIO) pins as standard. Some of these provide 3.3v power, some provide 5v power, some are grounded and the others can be used for input and output. Pins will output 3.3v when connected to ground and will be ‘raised’ as ‘on’ when 3.3v is supplied to them. You change, in software, whether a pin is input or output. Simplez. Details on the pinout of the RasPi’s GPIO can be found here. This should give you an idea on where to connect the circuit. The code described below uses GPIO 21 (GPIO 27 on rev 2 devices). This is mapped to GPIO 2 in the WiringPi library. The C code to handle this can be found on my GitHub account under the Raspberry Pi GPIO Interrupt repo. Compilation instructions are in the readme. It’s designed to act as an example though should work out the box. Be sure to tweak the PIN and IGNORE_CHANGE_BELOW_USEC constants to suit your hardware. 10000 micro seconds worked well for my “switch” which was rather just 2 bits of wire touched together. Better switches may cause less jitter.